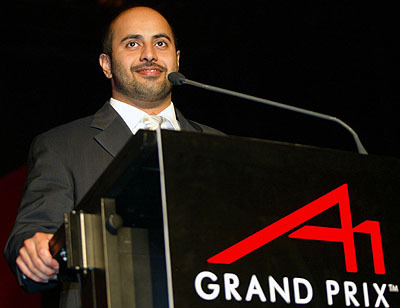 A1 Grand Prix founder, Sheikh Maktoum Hasher Maktoum Al Maktoum, is selling his controlling share in the series. The announcement comes as the second season of the series kicks off at Zandvoort in Holland, and in the wake of continued speculation as to the Sheikh's role in the business. The news also comes just after the release of the series' official race schedule, which sharp-eyed race fans will have noticed omitted Dubai, which was originally due to host the third round of the series. "I am happy," said Sheikh Maktoum , following the announcement. "I've built the series with fans in mind, I feel like I've fulfilled my promise to them by bringing A1 from concept to reality and and am confident that the World Cup of Motorsport will go from strength to strength. "I'd like to thank all investors, including Tony Teixeira as first investor, who shared in my vision, enthusiasm and commitment" he continued. "Having devoted all my efforts to making A1GP the success it is today, this transaction will allow me to devote more time to my Dubai International Holding Company." Commenting on the departure of Sheikh Maktoum, A1GP Deputy Chairman Tony Teixeira said, "Without the benefit of Sheikh Maktoum's vision and financial support, A1GP would not be as strong as it is today. We send our thanks to Sheikh Maktoum and know that as a keen motorsport enthusiast he will continue to support A1GP. He will always be welcome at any event." It is anticipated that the all cash transaction will complete within thirty days whereupon Sheikh Maktoum will step down as Chairman and Director of A1GP.